The HTA grew out of the Hospitality Diversity Task Force, a panel of industry, community, and labor leaders founded to promote opportunities for African American workers in Los Angeles’ top hotels and food service companies. Students at LAX Training; The HTA provides training for new hires or workers looking for promotions through improved job skills and work experience. Established in 2006, the task force quickly recognized that their work could not escape the broader context of the country’s deepening recession. As Los Angeles began to see record-high double-digit unemployment figures, experts noticed a bright light: nationally, tourism and hospitality remained a growth sector. From 2010 to 2011, hospitality employers added over 19,000 jobs in the Los Angeles area—more than any other sector, including previously top-ranked international trade. This growth was consistent with the national expansion in tourism and hospitality of 12.8% between 2002 to 2009, with records predicted for 2012 and 2013 in the metrics of room and occupancy rates in Los Angeles. Today, the partnership behind the HTA comprises hotel employers, labor, community colleges, workforce investments boards, non-profit organizations and other County and City agencies. Most critically, it includes hundreds of new and incumbent workers who have honed their skills and brought their drives to succeed into their workplaces, increasing guest satisfaction and making Los Angeles and Orange County a more competitive and attractive destination. Elected officials and public agencies recognized that expanded career ladder training infrastructure could “play a major role in our economic revival,” as none other than Los Angeles Mayor Antonio Villaraigosa put it in an address to graduates of an early HTA training. Major new developments such as L.A. LIVE would succeed only with a world-class workforce in place to welcome visitors from a growing international market and leave them eager to spread the word. Connections between the Diversity Task Force and public bodies from the community college system to the City of Los Angeles’ Community Development Department (CDD) resulted in the formation of the HTA. With interest from city leaders and strong evidence of its potential to help Los Angeles’ economic recovery, the Diversity Task Force moved quickly. Its initial training sessions had been financed by the Taft-Hartley Hospitality Industry Training and Education Fund (HITEF), built on contributions governed by UNITE HERE Local 11’s hotel and food service collective bargaining agreements. To deepen and expand its reach, the task force began to explore partnerships with the public workforce system, starting with West Los Angeles College, the California Labor Federation, and area WorkSource Centers. Together, these organizations developed a competitive, career ladder based proposal in response to the Los Angeles Workforce Investment Board’s (WIB) search effort to support the development of sector partnerships in key industries. In 2009, the WIB awarded the HTA $650,000 in Workforce Investment Act (WIA) funds through the Citywide Hospitality Sector Initiative, administered through the California Federation of Labor. The grant allowed the project to formally connect its work to the public workforce development system. The partnership’s track record helped it win a second competitive, sector-focused grant of $500,000, awarded in February 2010 by the WIB under the American Recovery and Reinvestment Act (ARRA) for the City’s High Growth Sector Initiative Program. 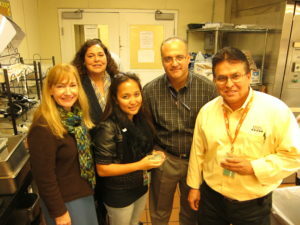 The initial plan was to train 100 workers in the food service industry. 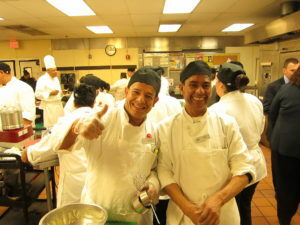 Project staff developed a program with Compass Group and Levy Restaurants to train 50 incumbent workers and 50 new hires for positions at Staples Center and Dodger Stadium. Sports fans will recall how the 2010–11 season faced uncertainty from looming NBA strikes and the battle between the Dodgers’ owners and Major League Baseball for control of the franchise. But who was thinking about how that uncertainty affected prospective HTA trainees? New hires trained by the program might search in vain for jobs to match their new skills—a discouraging turn that the training industry has often done too little to prevent. The partnership proved its adaptability by replacing the new-hires component with an additional hotel-worker training and a new training for HMS Host’s food service operations at Los Angeles International Airport (LAX), resulting in job offers to 100% of the students. The infrastructure developed through the Citywide and High Growth Hospitality grants allowed the HTA to craft a nimble response to changing conditions in the business climate. Industry, community and labor leaders developed a competitive, career-ladder based proposal to support the development of sector partnerships in key industries.